Championing our Services We’re delighted to welcome Elizabeth Gardiner CB to the Fellowship family as our new Civil Service Champion. Elizabeth is the First Parliamentary Counsel and Permanent Secretary of the Government in Parliament Group in the Cabinet Office and she’s keen to help the CSRF make a difference. Since taking on the role in January this year she’s already paid a visit to one of our local groups and has supported a publicity mailing circulated to all Permanent Secretaries across the Civil Service. and Golden Charter, aims to raise £10,000 to support our existing and future groups. The group visits have attracted coverage in a number of regional newspapers which has helped to raise the profile of the work undertaken by the groups within their local communities. 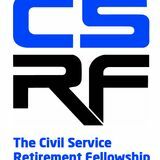 The Civil Service Retirement Fellowship Unit 11, Pepys House, Greenwich Quay, Clarence Road, LONDON SE8 3EY t: 020 8691 7411 e: enquiries@csrf.org.uk w: www.csrf.org.uk A charity registered in England and Wales No 255465 and in Scotland No SC039049 and a company limited by guarantee in England and Wales No 6297479 ©2019. 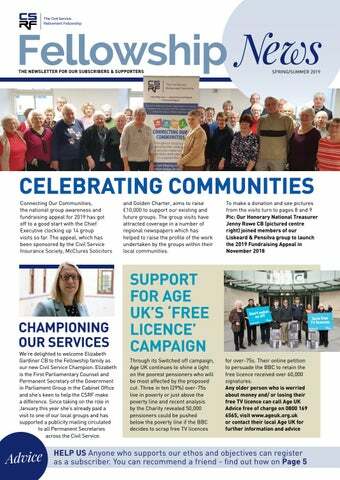 Fellowship News is published by the Civil Service Retirement Fellowship (CSRF). All rights reserved. The CSRF and the publishers declare that any publication of any advertisement does not carry their endorsement or sponsorship of the advertiser or their products unless so indicated. Contributions are invited and, whether or not accepted, submissions will be returned only is accompanied by a stamped addressed envelope. No responsibility can be taken for drawings, photographs or literary contributions during transmission or while in the publisher’s hands. Proof of receipt is no guarantee of appearance. In the absence of an agreement, the copyright of all contributions, literary, photographic or artistic belongs to The CSRF. This publication (or any part thereof) may not be reproduced, transmitted or stored in print or electronic format (including, but not limited to, any online service, database or part of the internet), or in any other format in any media whatsoever, without the prior written permission of The CSRF. The CSRF accepts no liability for the accuracy of the contents or any other opinions expressed herein. The views expressed in this magazine do not necessarily reflect the official views of The CSRF. Community Awards Winner Board Director Margaret Carter (pictured left) was the recipient of one of The Charity for Civil Servants Community Awards just before Christmas for her community work in Dawlish. Margaret received her award from The Charity’s Chairman Dame Sue Owen at an event held in The Grocers Hall. New Office Administrator We said goodbye to Yvonne Scott just before Christmas when she stood down from her role as Office Administrator to concentrate on recovering from a spell of ill health. But we’re pleased to welcome Eileen Turner to the Fellowship as her replacement. Eileen joined us temporarily during 2018 to help with the processing of our GDPR mailshot. She now takes over permanently and works three days a week at Fellowship Office. news Thank you for sharing any scam experiences you’ve had recently. We have included your reports here for the benefit of others. I had a call from someone claiming to be able to advise me on reinvesting my BT Shares. He said he was from TCG Corporation and gave a number (which has since turned out to be bogus). He has persistently rung me up trying to get me to give more details and I have now blocked the number on my phone. Sent in by Margaret Carter You can report any suspected scam or fraud directly to Action Fraud on 0300 123 2040 or visit their website www.actionfraud.police.uk If you’ve had something you suspect is a scam then let us know so we can share it with other CSRF members. You can email us direct on enquiries@csrf.org.uk or write in using the address printed on page 2. Caring for you The Charity for Civil Servants has been developing a new digital resource for carers, working with Carers UK, which launches during Carers Week 2019. If you’re a carer, do keep an eye out for this additional information from 10 June. This new resource will contain tools and information to support carers with their caring responsibilities. The Charity can also provide carers with a Carers’ Statement, outlining an individual’s caring responsibilities, helping them to inform carers and care-needs assessment conversations with carers’ organisations, GPs and Health and Social Care Professionals. Carers will be sent an information sheet specific to their needs. In addition, the Charity offers an Emergency Plan; a safe way to hold essential information about the person you care for, should you be unable to care, due to emergency or illness. The Charity continues to offer a series of regular webinars/dial-ins, covering caring as well as mental wellbeing support and money and debt advice. Recommend A Friend If you’ve been a regular subscriber to the CSRF then you can help us increase our supporters by spreading the word to friends. All the income we receive from subscriptions helps support the charitable services we provide. With the change to the subscription rules last year anyone who wishes to support our work and become a subscriber is eligible to sign up and as an extra incentive we’re running a special introductory offer for first-time subscribers (50% of our annual rate for 2019 – so just £16.50 for a single subscription or £27.50 for a joint for the first 12 months). We’re grateful to the support we receive from all our subscribers. But did you know that we offer a range of benefits by way of a thank you for your subscription? To refresh your memory we’ve included a run-down of all of them here for you. by West End Theatre Club, you can view and book direct via the CSRF website, www.csrf.org.uk and sign up for their regular newsletter. Pre-paid Funeral Plans Working with Golden Charter Funeral Plans we are able to offer you the opportunity to save money for the future through a pre-paid funeral plan. If you are interested in finding out more you can call them FREE on 0800 090 2342, quoting reference CSRFWB07. Talking Heads Our volunteers come from all over the UK, from many different walks of life, are aged from 18 to 80 and have a huge range of interests. They are united in their commitment to give some time to help improve the health and wellbeing of any beneficiary wanting some companionship. We’re delighted to introduce a few of newest befrienders. Is a 22 year old art student about to begin her degree at the University of West England in Bristol. She loves travelling, art history, fashion and cooking and in her spare time she enjoys nature, plants, crafts, reading and her cat. Works for an online lifestyle store and found out about our befriending services from a friend. She studied Politics and International relations at university and loves gardening and the great outdoors. Do you have some time to give to volunteering on our befriending schemes? Was formerly in the RAF and also worked in the MoD Guard service. He’s interested in astronomy and the universe and has been active Phone Buddy for about three years. He has recently joined the National Visitors Network and now makes calls and visits each month. Our Befrienders mainly provide monthly visits with the average visit lasting 1-2 hours. Phone Buddy 1. 2. 3. 4. 5. National Visitors Network 1. 2. 3. 4. 5.
enjoying having someone else to talk to (43%), feeling more engaged with the wider world (22%) and feeling less isolated (20%). Alternatively you could sign up to make a regular donation to support our ongoing work via direct debit. As we receive no government funding we rely on the money we raise through regular subscriptions and donations to support and safeguard our work. By leaving us a legacy, however big or small, you would be helping to make an important contribution to that. Our legal helpline partners McClures Solicitors are able to advise you on all aspects of writing a will or undertaking a will review and this includes how to leave a legacy. You can contact them on 0800 852 1999. Make your gift worth a quarter more at no extra cost to you! If you are a UK taxpayer The CSRF can reclaim the tax you’ve paid on your donation. Please tick the Gift Aid declaration box below I want to Gift Aid this donation and any donations I make in the future or have made in the past 4 years. I am a UK taxpayer and understand that if I pay less Income Tax and/or Capital Gains Tax than the amount of Gift Aid claimed on all my donations in that tax year it is my responsibility to pay any difference. If you pay Income Tax at the higher or additional rate and want to receive the additional tax relief due to you, you must include all your Gift Aid donations on your Self-Assessment tax return or ask HM Revenue and Customs to adjust your tax code. Please notify us if you want to cancel this declaration, change your name or home address or no longer pay sufficient tax on your income and/or capital gains. money in the bank. Adrian enquired on the health of her Mum – the daughter responded “she has dementia and didn’t know what day of the week it was”. Unfortunately it was too late for a Power of Attorney. The daughter was devastated and Adrian spent the next 10 minutes comforting her as she couldn’t stop crying. He was able to help eventually with setting up Deputyship, but this is much more expensive, time consuming and obligates the deputy to more work. It’s always painful to find out in hindsight a Power of Attorney would be easier, much cheaper and not as onerous on the attorneys. McClure Solicitors have seen many examples of clients who could have protected their assets against, for instance, care costs had there been an LPA in place but were too late because there wasn’t. They have seen many examples of families having to pay thousands of pounds in legal fees and disbursements which an LPA would have avoided. They have seen examples of elderly or disabled clients being taken advantage of or harassed by relatives when there wasn’t an LPA in place to protect them. So why take the risk? The good news is that McClure will prepare your LPA for £199 and will donate £30 to The Civil Service Retirement Fellowship. They include the Welfare LPA free of charge. They also let you decide whether and when to register the LPAs which can save you further money in disbursements. And their LPAs let you keep control as long as you are able. You can also change your LPA or cancel it at any time. There are many good reasons for having a Lasting Power of Attorney and no good reason not to! Later Life Planning Over the last 15 years, funeral costs have been rising every year2. In 2004, the cost of an average funeral was £1,920 and today it is £4,271 – an increase of a staggering 122%2. While no one can predict the future, if this trend continues, in 10 years the average cost of a funeral could be around £7,5003. With the rising cost of funerals2, it can pay to plan ahead. By arranging a prepaid funeral plan with Golden Charter, it allows you to choose your funeral director and fix your funeral director services included in your plan at today’s prices. That means, no matter how much the cost of these services rise in the future, you can have peace of mind that these costs have been covered in advance. 1. The Royal London National Funeral Costs Index Report, 2018. 2. SunLife Cost of Dying Report, 2018. 3. Projections by Golden Charter based on SunLife Cost of Dying Report, 2018. 4. Based on recent market share of funeral plans sold. For details please see Funeral Planning Authority statistics 2018 and Golden Charter Annual Review 2017/18. 5. For further details, please see goldencharter.co.uk/legal-disclaimer. 6. To be eligible for the M&S gift card you must call us quoting the reference CSRF0319. This offer excludes Basic Plans. The £150 gift card will be issued 90 days from the start date of your plan, providing that your plan remains in place and the necessary payments have been received. No cash alternative will be offered. Not to be used in conjunction with any other offer. 7. Golden Charter will give CSRF a donation of £220 for every plan purchased through CSRF. This offer excludes Basic Plans. You must quote reference CSRF0319. This donation will be made 90 days from the date your plan is made live. The Civil Service Retirement Fellowship works in association with Golden Charter, one of the UK’s largest funeral plan providers4 to bring you a solution to the rising cost of funerals, whilst helping to support local businesses. Golden Charter works with the largest network of independent funeral directors in the UK5, many of which are long standing, family-run businesses, providing a compassionate and professional service with a trusted place in the local community. By taking out a Golden Charter pre-paid funeral plan, you will also make a contribution to our fundraising activities as when you take out a Golden Charter funeral plan, Golden Charter will donate £220 to the CSRF on your behalf. This offer is exclusive to CSRF Subscribers. How to contact Golden Charter If the sound of planning ahead with a pre-paid funeral plan appeals to you, why not call one of Golden Charter’s friendly UKbased advisors today for FREE on 0800 090 2342, quoting reference CSRF0319. You’ll get a free pen just for enquiring. The Alzheimer’s Society run Dementia Cafes across the UK where you can go along to one of their local cafes and have a cup of tea with someone who understands. Their highly skilled staff are on hand to give you information and help sign post you to other available support services which is something that can help make a huge difference when you or someone you know has dementia. Talk to Us Do you enjoy a leisure pastime or volunteering activity that you’d like to share with others? We’d like to hear about your personal experiences so we can include your recommendations in future editions of Fellowship News. You can email our CEO David directly on david.tickner@csrf.org.uk or write to: Fellowship News, The CSRF, Unit 11, Pepys House, Greenwich Quay, Clarence Road, London SE8 3EY. How to Enter/Rules Entry to this competition is straightforward but please follow these rules: i. Select the picture you wish to submit (Images need to be high resolution and 300 dpi to be a suitable quality for printing). ii. Send in the picture along with your name, address, contact details, picture title and a sentence explaining why you have picked it (e.g. what makes it your favourite place). iii. You can submit your picture digitally to enquiries@csrf.org.uk (marked ‘2019 Photo Competition Entry) OR by post to: 2019 Photo Competition, The CSRF, Unit 11, Pepys House, Greenwich Quay, Clarence Road, London SE8 3EY. iv. By entering the competition you agree that if your picture is selected as a winning image you grant the CSRF the rights to use it for the purpose of raising funds and give consent for its use for that reason. This would include the use of the image for publicity purposes as part of the promotion of the cards. No payment will be made to individuals for use of a picture submitted. v.	All winning photographers will be credited on the cards and in association with any publicity to promote the cards. vi. If you require us to return your picture (if submitted in print form), please indicate this when you submit it. vii. The closing date/time for entries for this competition is 12 noon on Friday 26th July 2019. We love to hear from you so if you are moved to write or email in response to any of the letters printed this issue or on a completely different subject then please do. We will endeavour to print as many as we can but may have to edit them to fit the available space. word search Find the words hidden in the grid – they are all Rivers. 1, 2 & 3: Salisbury Plain group member Rene Boyce showed that hitting 100 did not mean any slowing down as she celebrated her centenary at the group meeting in October 2018. 4: Festive fun with members of the Portsmouth & Southsea group at their annual Christmas lunch in December 2018. 5: Members of the Eltham Group pictured on Goathland station during their holiday to Scarborough last year. 6, 7 & 8: Greenwich Riverside group enjoyed an interactive talk about the Tudors & Stuarts at the Queen’s House in Greenwich at their February 2019 meeting. 9: Top volunteers! Carol and Thanga (from the Sutton group) were the organisers of the group’s annual Summer Tea party and American supper. 10: Eltham group members enjoyed their annual Christmas lunch at Sophie’s Choice Restaurant in Sidcup in December 2018. 11, 12 & 13: Sutton group members celebrating Christmas at their lunch at the Spaghetti Tree in December 2018. 14: Belfast group members enjoying their holiday to Donegal 15. Greenwich Riverside group enjoyed a guided tour of Southwark Cathedral followed by refreshments in the Refectory Café in November 2018. 16 & 17 – Members of the Neath Port Talbot group at their Christmas Lunch at the Castle Hotel in December 2018. Trudy Thomas Organiser T: 0131 346 0208 The White Lady Cafe Glasgow Road Corstorphine Edinburgh Third Thursday of each month at 10.30am -12 noon (except December) until April 2019 then for summer meeting with Edinburgh Central group until July 2019. First Friday of the month at 10am 05 Apr 2019 “The History of tea, how do you take yours”. Talk by Jane Hennie. 03 May 2019 “Bringing stone age to life”. Talk by Katy England. 07 Jun 2019	“From Cabaret to Conservation”. Talk by Shelley Lozand. 05 Jul 2019 David Tickner, Chief Executive CSRF, visit to C/ Ford Group. Time permitting Bob Goff will talk about his life. Doreen Hughes Secretary T: 020 8461 4800 St Laurence Church Hall 37 Bromley Road Catford London SE6 2TS Second Tuesday of every month at 10am. We have a table top sale at each coffee morning - all donations will be gratefully received. Mrs June Brown Secretary T: 020 8891 4680 E: junebrownuk@hotmail.com Various venues in and around Twickenham.